I hear two themes come up repeatedly under discussion in our social media-saturated world. The first theme is the desire for what's real. For honesty. For a community that's open with each other about reality--the immense goodness and badness and weirdness of life, all of it. The second theme is the importance of being extremely careful in what you say to anyone, for fear of causing offense. In particular, I've noticed a frequent conversation surrounding the offensiveness of asking personal questions of others. It's my opinion that our commitment to the second theme--that of avoiding asking or answering personal questions--actually inhibits the possibility of the first theme--that of reality and honesty and tight-knit community becoming a possibility in our lives. I will tell you straight out--I cannot relate to bloggers who posts lists of "Things not to ask..." or "Things not to say...". My personal belief on ethics, morality, and general politeness of speech is that I have control of exactly one person's mouth--mine. I can control how I feel about what other people say to me, but I can't tell them what to say to me, and I have no desire to do so. 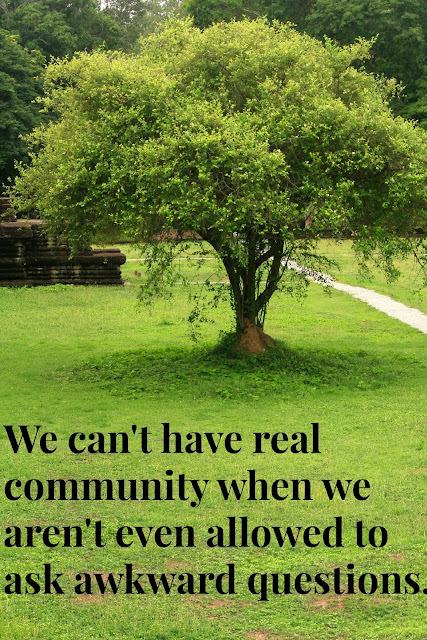 I honestly believe that real relationships and real community can only come about when we stop trying to dictate what other people are allowed to ask us. What is "real" about a relationship where we are forced to follow strict guidelines lest we step on another's toes? "So, why aren't you married yet?" "So, when will you get married?" "Are you sure about this? Don't you want to wait a while and think about it?" "Is there a reason why you're getting married in such a hurry? *wink wink*"
"Why the long delay? Cold feet?" "So, when are you going to have a baby?" "So, when are you going to have another baby?" "Are you feeling okay? You look awful." "So, what are you going to do with that degree when you're out of school?" "So, do you only like black/Mexican/white/Indian/Chinese people?" "So, like how allergic are you? Will you die if you go in the same room as gluten?" "Why did you want so many kids, anyways?" "So, can you really afford that new car/house/motorcycle?" I'm not saying that all questions you're asked make sense. I'm not saying they should all be asked. I'm not saying there's no such thing as a stupid question, because there definitely is. What I am saying is that there is something admirable in allowing people to ask you questions. There is value in being okay with people questioning the things that are of most importance to you, because explaining why they are important is a valuable exercise. It is because of my commitment to reality, to honesty, to community, that you will never hear me making a list of things I don't want to be asked. It is important to me that the people in my life feel free to ask me their questions. Not every question deserves or will receive a thorough and honest answer, but if people are too scared to even ask their questions because I've taken such a hard line on "you better not tick me off by questioning me about the things that are most important to me or else I'll write annoyed blog posts about you"...then I kind of think I've failed at community, at friendship, and at life, realistically. Our commitment to striving for real relationships and real community should be stronger than our commitment to building up strong walls to prevent our hearts from being hurt by a careless or rude question. I strive to, whenever possible, answer all the questions I receive in a reasonable way. Some questions--sure, even the person who asks doesn't realize till too late that they're basically impossible to answer. Some answers to the same question change over time, and that's okay. But there's power in being willing to answer even the awkward and personal and silly questions that others ask. When we first got married, I answered the question, "When are you going to have a baby?" with "As far as I know, not today." The answer has since changed to a less flippant, "Whenever God gives me one." In reality, every adult knows that there's no possible way to answer that question with an actual date, so yeah, it's a silly question, but I choose to see people who ask it as people who care about me and love me and love my future baby...rather than people whose goal in life is to annoy and offend me. Because in spite of all the evil in this world...honestly, it is the goal of very few people in life to purposely annoy and offend you. You simply aren't important enough for that. I got an email a couple weeks ago from my grandpa, asking every personal question under the sun--everything from questions about how much Angel's salary is to how much we're saving each month to when we're having a baby to what kind of visa we have to what our long-term life plans are. Grandpa has always been someone who has openly questioned every single life decision I've ever made--and I'm glad I have a person who cares enough to question everything in order to make sure that I have some sort of answer, some reason, behind why I do what I do. It's probably the East meets West coming out in me when I say I see the asking of awkward questions as love, and as real community. Because I live in a community where there aren't really any off-limits questions--and I've come to love that about my community. Sure, not all questions come from a place of love, but what's the harm in acting as if they did, and responding to a sarcastic or antagonistic question with an open and honest answer? Trust me, it's good for you to have an answer to the hard questions of life, and whether the people who ask you the question have good or evil motives, doesn't matter, You're not responsible for their motives. You're responsible for your own answer. Sure, in the wrong situation or with the wrong question you can always say, "You know, I can't answer that right now" or "I'm not comfortable with talking about that"--but in that case, you're letting it known that the responsibility is on you. Condemning other people for daring to ask the question in the first place really isn't going to achieve a world of truth and transparency the way we want it to. I've been asked some really sensitive questions in my life. Hey, as a teenager, I was even asked how many baths my siblings and I took each week (by someone who was probably over-curious about the inner-workings of a large family). I was once asked, at lunch, by a young woman I barely knew, if I slept with my husband before I married him. That made for an unexpected lunch conversation. Someone else asked me if I regretted my marriage. As someone who grew up in a small country in Southeast Asia, I've been asked if Malaysia is the biggest state in Indonesia. Trust me, I've been asked questions that have made me raise one or both eyebrows. But I have found it far more valuable for me to strive to be the kind of person who is open and willing to answer the awkward questions asked by others than to put effort into slamming them for daring to be so rude. Many times, when the awkwardest and most uncomfortable of questions gets asked, the person asking has something going on in their life that they're trying to figure out, and asking other people about their own experiences is one of their methods for figuring it out. Besides, when we have extenuating circumstances going on, and people ask us stuff about marriage or children or life plans--it gives us the opportunity to talk in a real way about singleness or health or the uncertainties of life...and that's the stuff that's going to bring us together. Not lists of questions that you should never dare to ask. Such lists are not the stuff community is made of. So, single people, answer us as to why you aren't married, whether the answer is, "I have no idea, apparently all the guys I've ever met are blind." or "I'm just not interested" or something totally different. Bachelor's of Arts majors, go ahead and tell us about both your crazy dream job you'd love to land after school, and the more realistic plan to actually pay off loans and live a normal life, grateful that you got to study a completely impractical subject that thrills you to your core. Go ahead and say you feel self-conscious about probably not working in the field you studied. People with allergies, talk openly about how your allergies affect your life and the clever strategies you use to make sure that you, and not your allergies, remain the boss. In the meantime, I'll be over here, talking about the beautiful land that I love and the impractical college major I chose and the awesome husband I married and the kids I dream of having and the lifestyle I seek to live--because you can ask me anything. I might not answer the way you want me to, but you are completely free to ask. How do you respond when people ask you awkward questions, or questions that somehow touch a sensitive chord in your life? Here from the Blogging Elite! Loved this post, and I do agree! I think that when the questions come from a place of true concern and/or curiosity as opposed to someone trying to deliberately rile you up, there's no harm in them. I grew up in Kenya, and got my fair share of questions about 'Africa', but didn't mind most of them because people genuinely wanted to know what it was like! I didn't have my daughter until my late twenties and every single family event my grandmother would ask, "when do you think you're going to get married, or have a baby". It used to drive me insane. Now she asks, "When are you having another baby." Its a never ending cycle. This was an interesting read. Very well written too. I'm finally at the age when most of those questions have passed. The only "rude" question I can remember being asked was: why are you getting married now, why don't you guys wait? That was an interesting conversation starter! I love this post of all these traditional questions which are well meaning to the person asking but puts people on the fence! Interestingly, at 27 weeks pregnant I have only had 1 person ask when I'm due (and it was one of the blunt, autistic students I work with). Others just tend to stare at me for a long time like they're trying to figure out if I just really awkwardly gain weight in my stomach or what. Out of all the questions you posed, I do think that issues dealing with fertility can be some of the most sensitive, on the other hand, I like your suggestion of continuously responding as though the question had been asked in love, regardless of the circumstances! I think you've hit on a great point with your Grandfather. He's asking out of love and a genuine interest in you. When people ask questions just to be nosy or impertinent that's a whole different story. I'll still answer them, but the heart behind the question matters a lot! i certainly agree with many aspects of this because you are right, community means the ability to be open and connect. for me though, i do think there are some questions that just get tiring and although it is up to us about how to feel and react to them, sometimes i'm just over it. this isn't related to blog world but rather the face to face world when my husband and i do events or workshops. we are constantly asked by strangers why we don't have kids or told blanket statements like "well husband and wives who work together always get divorced so...good luck." maybe it's my social worker self but i feel as though not everything is everyone's business. there are instances when i would like to see people think about the effect they could have on asking someone something simply because they are curious. i have a close friend who has been trying for 2 years to get pregnant and struggling with infertility so when people ask why they don't have a kid yet, it's quite emotional for her. i think there can be a happy medium out there. thanks for writing about this! Wow. This has really opened my eyes today. I get annoyed with questions sometimes, but I've never been the type to scold anybody for asking. I've never written a post about "what not to ask..." or anything. But I've complained to my husband and those closest to me. And I've certainly been guilty of not asking those questions for fear of coming across rude. But I've never thought about how those questions lead to community and relationships. I mean, I've always known they do, of course. That's how you get to know someone. By asking questions and talking about your personal life and convictions. But I guess I've just never thought about the overall themes in our society today. And how those first two themes you mentioned really contradict each other. Very thought provoking! Thanks for writing this! I do agree that it can be off-putting to have a list of questions "not to ask." But at the same time, like you said, there are definitely questions that frankly people should not be asking. And I'm not talking about blogging, just about real life and common sense. There are certain questions that not only don't need to be asked because honestly no one else needs to know, but they can also be very hurtful. If people don't realize that there are certain things that shouldn't be asked they are just perpetuating hurt. Like Chelsea said, I have a couple of friends struggling with infertility and that question of when they will have a baby can cause them to break down. Most of the questions you've posted are just annoying haha, but I think it's important to be aware that sometimes what seems like curiosity can cause pain. That being said, I love that you've written about this and aren't afraid to discuss topics and your opinion! Thanks for sharing! Thought provoking post, Rachel! I love how you connect asking questions with building community! I try not to be offended by questions (my mother in law is the queen of questions!) and sometimes it's just a difference in personality - I'm a more private person so certain questions make me uncomfortable and a person may have no harmful intentions when asking. As we're nearing our first anniversary, we are getting BOMBARDED by questions about when we're going to start a family. It's been family members, people I casually know—even the lady at Walgreens when I was checking out with my anniversary card. To my close friends and family I give them an honest answer (my health comes first) and to people I don't know so well, I just say we're enjoying being newlyweds and adjusting to married life. I come from the same place as you, Rachel! For me, every awkward question is an opportunity to share a little bit about myself, my beliefs, and my feelings on the given topic. I am all about awkward questions, not because I am an awkward person but because being a little bit awkward sometimes is part of building a genuine relationship. It an opportunity to love or to shame - its up to me to pick which answer I give! Love this post, just like all the others too! Your questions are tough for me! I typically take things to heart yet am not very confrontational, so I tend to bottle in frustrations if people ask me difficult things. On the other hand, I'm pretty much an open book so I try to just be honest any myself :) Sounds like you are the same! I never did like those lists of "things never to say to _______." Most of the time it seem like the author goes out of their way to be offended by innocent comments, even if they are in slightly poor taste. I can't tell you how much I've LOVED this post! In a lot of ways I'm still learning to detach my identity from the approval of others-- and as a recent college grad, that can be really hard. Saying how I make money is not the same as being able to share my heart's dream-- and of course I want people to ask the latter. I love your openness and I hope I can respond with grace and honesty. Because really, expecting people to disapprove of my answers means I'm passing judgment on them first, right? This was a really good post. I think I'll be more careful about the questions I mentally dismiss as rude in the future. And I have noticed a trend of blog posts about things to never ask.... The lists are getting long. I think that in general, most people are curious. As someone who doesn't even want children though, I think asking people about babies is super personal, just because I know so many people who are struggling with it. People mean well when they ask... but still. Some things are just more touchy than others. Overall, I have the same attitude but the baby question can get very tiring when you struggle with any sort of infertility. There are days your eyes well up with tears as you try to put on a happy face and keyboard an appropriately cheerful response that doesn't make the questioner feel like a horrid person for even asking. Sometimes even the most witty answer comes out with a biting edge of sarcasm. I've learned my own responses over time, but I do think that is one reason why that is such a hard question for so many of us. There are days we can't control our emotions about it. And I have one and was hit with secondary infertility so for me it's even harder sometimes when a relative, especially, forgets it's like, "don't you know this?" but of course that isn't what you should/can say appropriately. Interesting take with some great points. I don't get mad when people ask those questions, but as someone struggling with infertility I do get annoyed when someone I don't even know very well keeps pressing and giving their 2 cents. Real conversation is good, but it's also a skill to know when to be silent and just listen. This was a really good post for me to read, Rachel. Since moving, I've become very closed off and probably not super approachable to the new people I've met. I'm afraid to ask them to go to coffee, and when they ask about me or get 'too personal' I think they're just trying to be polite, make conversation, or be nosey... in reality, maybe they DO care and I'm not giving them enough credit. Sharing this post - well said. I loved reading this, mostly because I think about "questions you should never ask" in the same way. I've never been one to be offended by personal questions because I've always believed that the person asking the question is genuinely curious with no ill intent. Plus, many of the questions help me to think through my own thought or emotions. Can you imagine what relationships and the world would be like if we never asked each other potentially awkward/personal questions?! It would be such a lonely and sad place! These types of questions start to rub me the wrong way the more I get older. It may be someone's idea of small talk but I feel like they can never understand why something hasn't happened to someone! I really love this. I both try to never ask these questions and I admire people who do, because they really want to know you and they're interested in your life. This is beautifully written! I mostly get questions about why I'm South African and white... and I have my fair share of answers for that ;) But you're right - most people mean absolutely no harm and are just curious... I think it says a lot about a relationship where one can ask questions. I completely and 100% agree. The lists of things not to say or ask are exhausting and ridiculous. The only time it gets annoying for me is when I'm asked the same question over and over and over. Otherwise, I've just learned to be entertained by them instead. This post. Yes. Absolutely yes yes yes. "It is important to me that the people in my life feel free to ask me their questions. Not every question deserves or will receive a thorough and honest answer, but if people are too scared to even ask their questions because I've taken such a hard line on "you better not tick me off by questioning me about the things that are most important to me or else I'll write annoyed blog posts about you"...then I kind of think I've failed at community, at friendship, and at life, realistically." Yes, yes, yes. There are some people in my life who I honestly walk around on eggshells because of this very thing. They have posted so many things like this to social media that I find myself unsure of what I CAN ask about. You took the words right out of my mouth with this paragraph and this whole post honestly. "I have found it far more valuable for me to strive to be the kind of person who is open and willing to answer the awkward questions asked by others than to put effort into slamming them for daring to be so rude."